Donie Smith struck two goals for the winners tonight in Castlebar. Diarmuid Murtagh was amongst the goalscorers for Roscommon tonight. ROSCOMMON RUTHLESSLY DUMPED Mayo out of the Connacht U21 football championship at Elverys MacHale Park tonight as goals from Mark Nally, Diarmuid Murtagh and a Donie Smith double proved the difference. Mayo gained the early initiative thanks to Evan Regan’s strike in front of over 3,000 spectators. Points from Conor O’Shea and a Regan free had them a goal to the good midway through the half – but the Rossies then struck 1-3 without reply and never looked back. Nally netted to set them on their way before Murtagh and a Smith penalty on the stroke of half time saw them cruising 3-5 to 1-3 at the break, with Mayo struggling to gain any sort of foothold to penetrate the stern Roscommon defence. Murtagh was causing havoc and the Rossies netted a fourth straight after the restart when Smith bagged his second to end another sweeping move. Mayo improved slightly with James Shaughnessy, Adam Gallagher, Evan Regan and Eoghan Collins pointing but it wasn’t enough. Roscommon put the icing on the cake through Enda Smith with his first touch from the bench and now face Sligo in the Connacht semi-final on Wednesday with a time and venue to be confirmed. Scorers for Roscommon: Diarmuid Murtagh 1-5 (0-3f), Donie Smith 2-1 (1-0 pen), Mark Nally 1-0, Ciaran Kilcline, Mark Healy, Enda Smith, Ultan Harney 0-1 each.Scorers for Mayo: Evan Regan 1-3 (0-2f), James Shaughnessy, Conor O’Shea, Diarmuid O’Connor, Adam Gallagher, Eoghan Collins 0-1 each. Subs: Ronan Daly (Padraig Pearses) for Murray (44), Shane Killoran (Elphin) for O’Rourke (50), Kevin Finn (Strokestown) for Nally (51), Jack Early (Oran) for Kilcline (57), Ultan Harney (Clann na Gael) for Corcoran (60). MAYO: Matthew Flanagan (Balla); Kevin Lynch (Mayo Gaels), Liam Kitterick (Westport), Aidan Butler (Claremorris); Cian Burke (Ballymun Kickhams), Stephen Coen (Hollymount/Carramore), Padraig O’Hora (Ballina Stephenites); Padraic Prendergast (Louisburgh), Diarmuid O’Connor (Ballintubber); Gareth O’Donnell (Charlestown Sarsfields), Michael Plunkett (Ballintubber), Adam Gallagher (Mayo Gaels); James Shaughnessy (Claremorris), Evan Regan (Ballina Stephenites), Conor O’Shea (Breaffy). Subs: Eoghan Collins (Ballyhaunis) for O’Hora (24), Steven Conroy (The Neale) for Plunkett (ht); Anthony Jordan (Moy Davitts) for Prendergast (ht); Michael Hall (Breaffy) for Burke (bc) (44), Sean Regan (Ballina Stephenites) for Shaughnessy (58). Email “Roscommon put four goals past Mayo to claim comfortable Connacht U21 football win”. 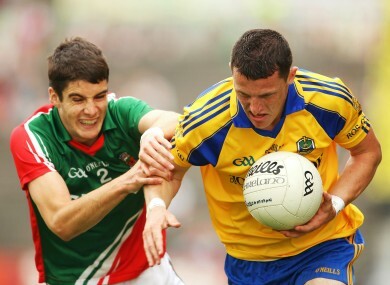 Feedback on “Roscommon put four goals past Mayo to claim comfortable Connacht U21 football win”.